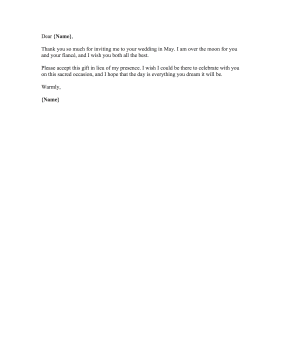 Gracefully decline a wedding invitation with this personal rejection letter to the couple. Thank you so much for inviting me to your wedding in May. I am over the moon for you and your fiancé, and I wish you both all the best. Please accept this gift in lieu of my presence. I wish I could be there to celebrate with you on this sacred occasion, and I hope that the day is everything you dream it will be.